Regulatory approval times for genetically modified (GM) crops are increasing in many countries. 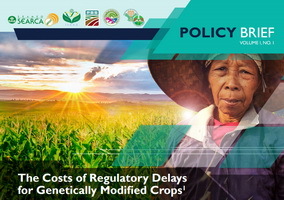 The impact of unjustified regulatory delays due to policy inefficiencies, lack of coordination or unnecessary and redundant requirements may particularly affect the public sector and international R&D investments which are intended to address the need for GM crops in developing countries. The first in a series of policy briefs released by the SEARCA Biotechnology Information Center (SEARCA BIC) is based on a study co-authored by Dr. Jose Benjamin Falck Zepeda, a Research Fellow at the International Food Policy and Research Institute (IFPRI) and Policy Team Leader at the Program for Biosafety Systems (PBS). The study sought to analyze the economic impact of regulatory delays for GM crops. By modeling several regulatory delay scenarios, results reveal that longer regulatory delays are associated with higher investment risk which could possibly discourage investments in the development of a GM crop. Findings of the analysis also emphasize the need for regulators, decision-makers, and developers to reduce time delays and increase the efficiency of coordinating decision points along the product development cycle -- for R&D, regulatory review, and compliance to optimize costs and time in delivering a product.